In this issue we map rural residency programmes and artist projects further north, cross borders and ride conceptual frontiers. Newcastle-based sound recordist whose award winning work for David Attenborough has taken him across the globe into the most strange and remote places on earth, but whose pioneering pop electronics in Cabaret Voltaire earned him accolades decades before. Life on the limits of recordability, whose article in David Toop’s seminal musicology book Haunted Weather inspired its title. Elisa Oliver writes about Watson’s creative history and interviews him at his base at the South Pole about his current work recording for the Attenborough BBC series, The Frozen Planet, to be screened in 2011. 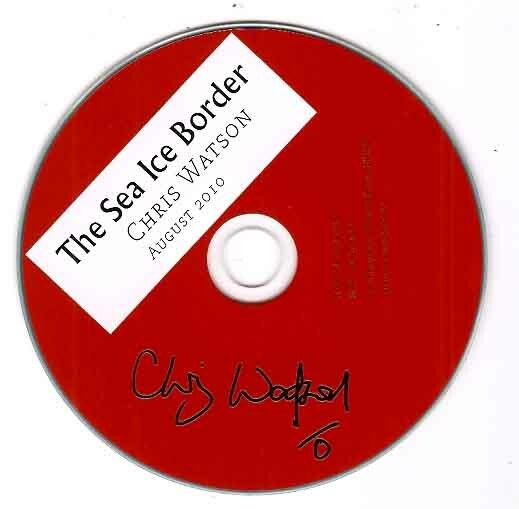 A CD of Watson’s recording, The Sea Ice Border, especially created for Corridor8, comes with the journal. The ‘New Wave’ of Science Fiction took from literature and contemporary art as well as traditional SF. It explored inner space rather than outer, and was more concerned with mythologising the present rather than the far future. New Worlds, the UK platform for the movement, championed writers and artists like William Burroughs and Mervyn Peake and published the early writings of J G Ballard and Michael Moorcock as well as other exponents such as the Americans Thomas M Disch and John Sladek and converts from the ‘old guard’ like Brian W Aldiss. The magazine also featured contemporary artists such as Eduardo Paolozzi, who was listed on its masthead as ‘Aeronautics Adviser’, and Richard Hamilton. Carol Huston looks at the magazine’s relationship with Pop Art, the influence of conceptual art in some of its writers like Sladek, the magazine’s distinctive graphics and design and looks at its legacy as a unique unsung multi-media product of its time and a hidden influence on much that has come since. Apocalyptic survivalist architecture and philosophy from North Wales. This duo craft a new definition of creativity in the archi-artist – the harbingers of a doomed future. But for all their dystopian environmentalism the Morrison’s work is focused upon an interaction with the surrounding community, either through the staging of apocalyptic interventions in the cityscape, road blocks, spit cargo lorries, or through the construction of buildings and vehicles to serve community means, from a futuristic park shelter to a mobile science fiction library engaging a diverse audience in participating with their futuristic visions. Roger Luckhurst looks at their recent work in relation to the structures and themes of science fiction. On 27th May 2009 – a date chosen because it was the day of the European Football Championship Final – the celebrated British author and psychogeographer Iain Sinclair followed the ghosts of WG Sebald and De Quincey on a Manchester Walk. Commissioned by Corridor8 for an iPod broadcast as part of its inaugural launch, the walk took the author from Urbis and the Cathedral in the heart of the medieval city to Old Trafford, Chorlton Water Meadows and Ringway (Manchester) Airport. With illustrations by recent Manchester Metropolitan University graduate Sally Renshaw. Lapp takes over the Flash Artist Program started in last issue, selecting and interviewing seven artists or artist groups who each represent a section of the rich arts community in the North of England: Libia Castro and Ólafur Ólafsson, Brass Art, Nick Crowe & Ian Rawlinson, Janis Rafailidou, Brindys Snæbjörnsdóttir & Mark Wilson, Hayley Thompkins and Sam Watson. Adam Sutherland, director of Grizedale Arts, introduces the development of the renowned arts centre at Grizedale, Cumbria, and their successful artists residency programme, discussing further the lure of the rural as a site for the development of artists’ practices and a rich area for engagement with local communities. A feature on the new Art Gene architecture project. Situated in the heart of the Lake District, and host to a programme of artists residencies and collaborative projects, artist-led initiators Art Gene have most recently worked with final year architecture students from Newcastle University to propose contemporary follies for their rural town of Barrow-in-Furness. Working with both local residents and experimental means of production the architects responded to the unique location of the community through a series of engaging fantastical structures. Phil Griffin writes about the project, its progress and Art Gene’s purpose in helping to regenerating the region. Who collects art in this arena? What is the force that compels them? Are they market driven or do they drive the market? From the Bowes Museum to Frank Cohen’s ill-fated northern gallery, from Dr Mark Turner to collectors of contemporary Northern Irish Art, who is it that influences the real economy of the contemporary art across the region under review? Taking the form of a series of case studies or portraits informed by interviews, Mark Doyle profiles seven contemporary art collectors/collecting initiatives based in the Northern area of the UK and Northern Ireland, from some of the most influential in the UK to those starting out, and uncovers their drives, passions and motivations behind collecting – Greville Worthington, Tim Dixon, Gather Collective, Catharine Braithwaite, Richard Greer, Diane Howse and Alan Graham. The Centre for New Writing was launched in September 2007 to explore and research collaboration between creative and critical writing, and broaden access to literature and writers in the region. Corridor8’s collaboration begins with a piece of original fiction by Centre co-director Ian McGuire, part-autobiographical, part-‘freewheeling meditation’ on the borderlands theme. Rural Wonderlands – Neville Gabie explores the temporary states that are created in both mind and place through the act of putting oneself into unusual or extraordinary situations. We begin our focus on his work through his ‘iceberg’ piece at the Tatton Biennial 2010 where, in an inversion of the normal traffic towards remote locations, he brought a very large chunk of ice from Greenland to reside in the verdant grounds of the park at Tatton. David Lillington questions the artist about the relationship between Otherness, people and place in his work, and how his own experience of residency programmes as diverse as the Australian outback and the Antarctic give insight into the human condition and our ability to survive creatively in these hostile and challenging environments. The search for a new art education by educators and artists is a contemporary concern, as witnessed by the prevalence of features in publications like Art Review and seminars like the current Deschooling Society at the Serpentine. Corridor8’s own Derek Horton started the ball rolling in Issue 1 with his article ‘Sitting on a Log: Imagining the SuperCity Art School’, which quickly became the stimulus for the forthcoming Corridor8 art education seminar at Liverpool John Moore’s University, in conjunction with Liverpool Biennial 10. For Issue 2 Horton takes his arguments further in a far-ranging article that looks back to the Free School movement as a contemporary model for collaborative learning, and cites the work of current artists groups as future models for radical and participatory means of knowledge sharing. Finally, in this new column we include practitioners and practices that sit outside the remit we set ourselves each issue, but who nonetheless inform those themes. This issue ‘Contemporary Grotesque’ by Mit Senoj; ‘Invisible Eye – Remoteness in the Work of Shona Illingworth’ by Shona Illingworth, and ‘Ecolating Ecology: An Artist-led Sustainable Residency at Sea’ by Tapio Mäkelä. The Sea Ice Border (August 2010). Signed Chris Watson CD Free with Issue 2. A limited number of 50 copies have been signed by Chris Watson. These are available to buy on a first come first served basis at no extra cost. PLEASE NOTE that if a signed copy is required then an instruction must be sent to us to this effect, otherwise we will send an unsigned copy. If buying through PayPal please leave the instruction in the box titled ‘Add Special Instructions to the Seller’. 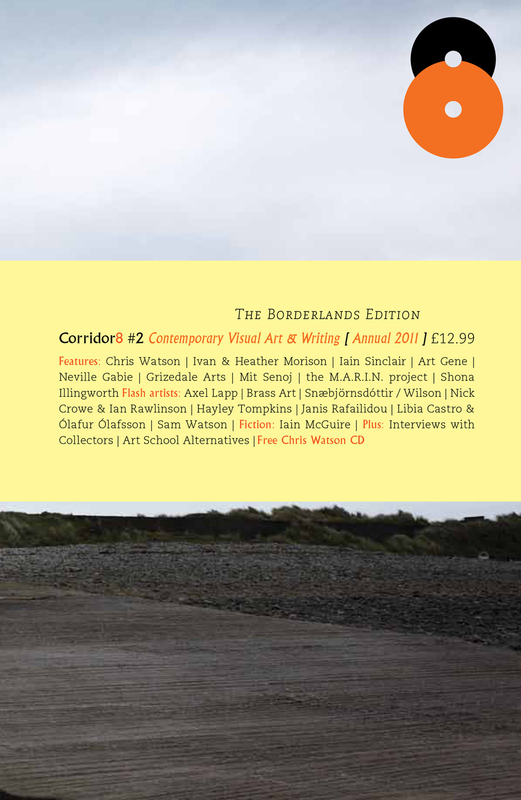 Issue 2 of Corridor8 is funded by Arts Council England.